UBTECH Robotics, a global leader in intelligent humanoid robots, have announced it's latest offering, the JIMU TruckBots Kit! 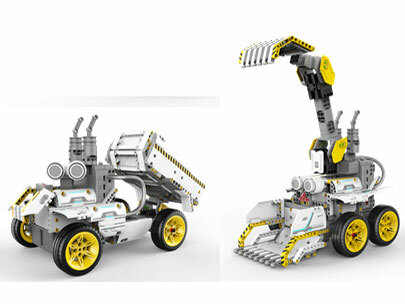 Revolutionising the way kids learn to code and encouraging STEM learning, the JIMU TruckBots Kit is the latest addition to the award-winning JIMU Robotocis family. Kids aged 8+ can build, program and code two different robots; GravelBot and DozerBot - or make their own imaginative creation, all while having pure fun. The JIMU TruckBots Kit uses the free JIMU 3.0 Blockly app now available on Apple iOS or Android Smart Devices for children to simply program and control their robot. The intuitive JIMU app provides animated instructions to guide users step-by-step through the building process. The Pose, Record, Playback (PRP) function allows users to position their robot in any pose, record and make it move in an endless sequence. Review: Creative minds will relish getting their hands on TruckBots to build their own robot to train. Finally a toy to engage the curiosity and encourage learning on a whole new level, TruckBots will be hot on the Christmas list this year.